The rain stayed away from the Circuit de la Sarthe on Thursday for the second day of qualifying for the 2015 24 Hours of Le Mans, however warmer ambient and track temperatures failed to allot many moves up and down the order on the final starting grid. However, one major contender for glory this weekend suffered a setback that has put the squad in adversity fighting mode ahead of Saturday’s start. Near of the day’s first qualifying period, Jan Magnussen driving the No. 63 Chevrolet Corvette C7.R in the GTE-Pro division, lost control of his ride in the difficult Porsche Curves section of the 8.45 mile layout and made heavy contact with the outer guardrail. The Danish veteran was helped out of the car by marshals and placed on a backboard and transferred to the track infield hospital where he was treated and released a few hours later. Magnussen has been cleared to drive for the rest of the weekend, but Corvette Racing will be forced during the Friday off day to thrash the entry back together in time for the start on Saturday afternoon. 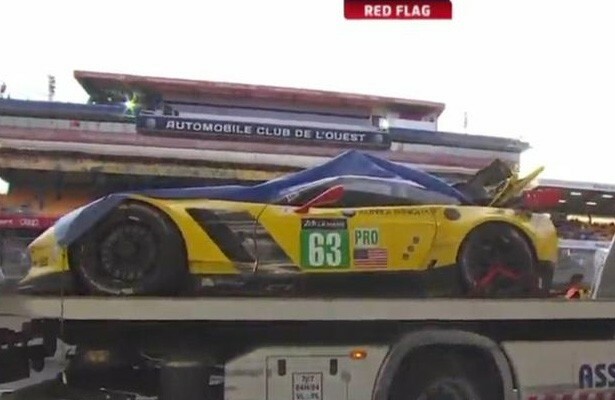 It is unclear based on on-board camera footage what caused the C7.R to veer off at the time of the incident, although the bizarre nature of the shunt would seem to rule out driver error. The incident brought a premature end to the initial Thursday session, while in the final night running, the team’s sister entry made only a limited appearance on course. The resulting incident, plus time improvements by some of their GTE-Pro rivals means the two-car American squad will start well back in the field, behind Aston Martin Racing and AF Corse Ferrari, who each held onto their provisional front row positions earned on Wednesday night in both GT divisions, GTE-Pro as well as GTE-Amateur. Among the biggest improvements on day two among grand touring runners included the Riley Motorsports Dodge Viper team in the GTE-Amateur class, who moved up from a mid-pack position on Wednesday to fourth in class on Thursday as lead driver Jeroen Bleekemolen knocked two seconds off his time from Wednesday. Patrick Long also found extra speed in the Patrick Dempsey-entered Porsche 911 RSR and will lineup behind the Riley entry in the fifth position. 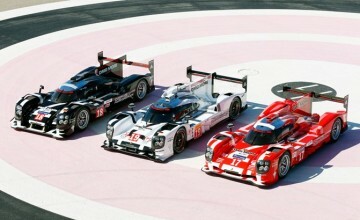 In the Prototype categories, Team Porsche maintained their hold on the top three positions on the LMP-1 and overall starting grid, despite being unable to post a lap under the 3:20 barrier on Thursday. 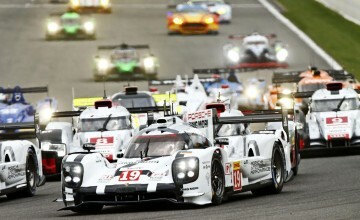 Neel Jani claimed the pole position with a track record breaking 3:16.887 pass on Wednesday. Audi Sport Team Joest held onto the next three spots in the queue with the No. 7 and No. 9 swapping the fifth and sixth places on the grid, as Andre Lotterer’s 3:20.861 was the fastest lap posted by any of the 56 entries on Thursday. Finally in LMP-2, KC Motorsports Group’s (KCMG) ORECA 05 coupe held onto the pole position, but will be joined by a different rival on the front line Saturday as opposed to the provisional lineup from Wednesday. G-Drive Racing’s Sam Bird fired off a 3:38.939 lap early in the final qualifying period to bump the Greaves Motorsport Gibson 015S spyder off the front line by less than two tenths of a second over the course of an 8.45 mile circuit. With the G-Drive Ligier coupe alongside the ORECA coupe, Gibsons will fill out the second row as Greaves will be joined by reigning Le Mans LMP-2 class winners Jota Sport, who were unable to improve on their time from Wednesday. Moving up to the third row of the LMP-2 lineup Thursday was Signatech Alpine, who overcame a penalty levied by the ACO on Wednesday to claim the position alongside the other ORECA coupe belonging to Thiriet by TDS Racing. Signatech picked up the penalty for using too much of the road on the exit of the fast Tertre Rouge corner and had each of its first five laps from the Wednesday session erased from the ledger ahead of Thursday’s action. Stay tuned to Rubbings Racing for continued coverage of the 24 Hours of Le Mans including full coverage this weekend on Twitter @MattEmbury.